An unpaved section of road past Hana. Photo by Cameron Johnson. Waterfalls at the Blue Pool. Photo provided by Hawaii Tourism Authority (HTA)/Ron Dahlquist. 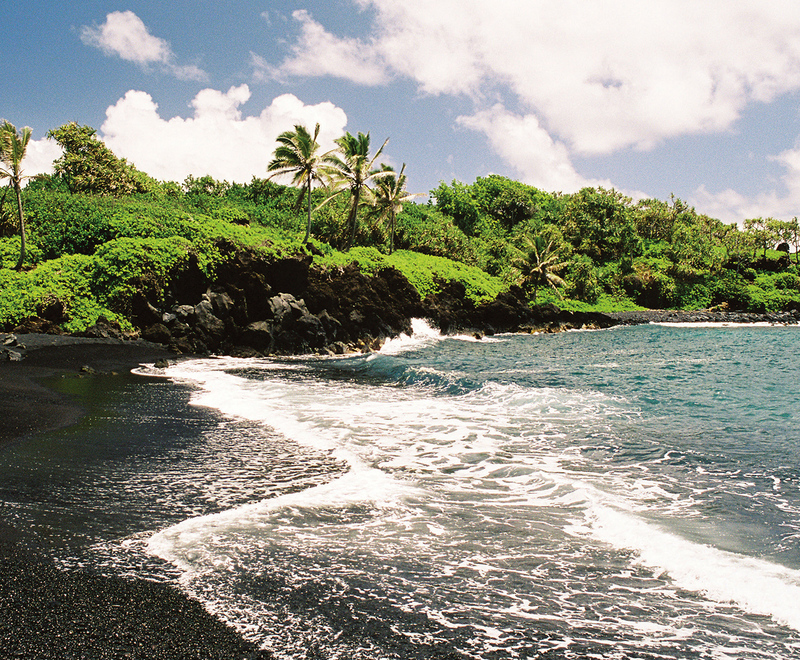 Black sand beach near Hana. ©Jay Spooner/iStockphoto. 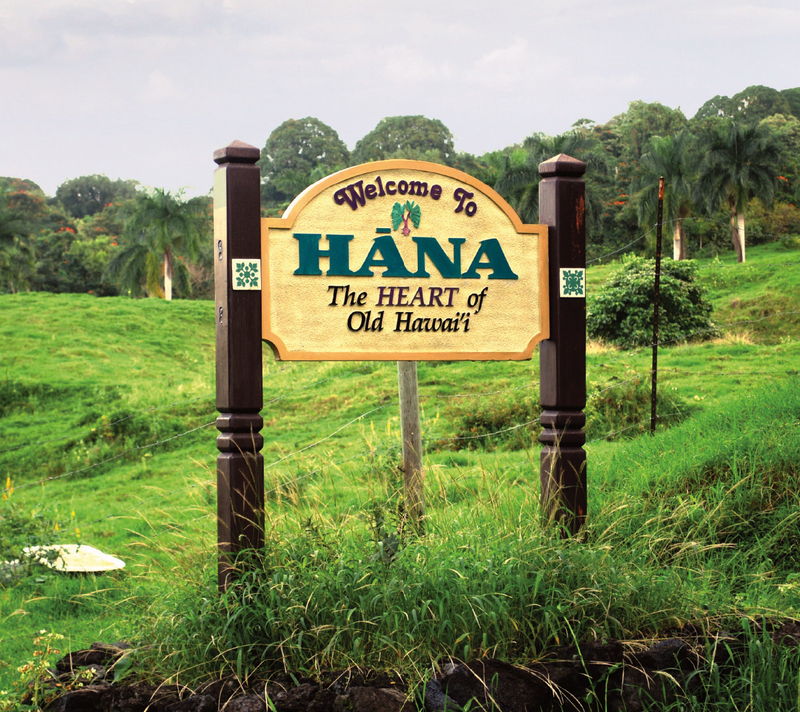 Sign welcoming visitors to Hana. ©Chris Driscoll/iStockphoto. The Serenity Pool at the Four Seasons Resort Maui. Photo by Kyle Rothenborg. The island of Maui is actually two volcanoes that are joined with a flat expanse in the middle. The Road to Hana winds its way around the eastern section, running from the middle at Kahului around the Haleakala volcano to the village of Hana. Many visitors then drive a few kilometres farther, to the pools at Oheo Gulch, before turning back to head home the way they came, but there is also the option of continuing on to the rugged, partly unpaved road around the southern slope of the volcano, eventually taking you full circle back to Kahului. The latter option is not for the faint of heart, or at least that’s what the rental car agencies on the island would have you believe. Many include clauses in their agreements that prohibit driving on this rough section of the Piilani Highway past Hana, citing that it’s dangerous (and it is true that rockslides have caused road closures in the past) or that the unpaved section puts undue wear and tear on the cars. Yet many travellers and residents I speak with who have driven it say its condition is exaggerated; one person says that the real reason rental car companies prohibit driving that way is that, in the event of a breakdown, they don’t want to have to send a tow truck all the way around the island. Whatever the reason, if you do decide to take a round trip, don’t lock your keys in the car. I will be making the trip in a Mercedes-Benz C350; its dynamic handling is ideal for the narrow, twisting roads, and I’m hopeful that the unpaved sections are indeed as mild as I’ve heard. My day begins less than optimally when I wake up to the sound of rain pounding the window of my hotel room. I start out amidst the onslaught, making my way to the city of Kahului and getting on the Hana Highway proper. My first stop is in the town of Paia for some fortifying Kona coffee as the rain continues to pour. After half an hour of staring out the window, I decide that there’s nothing to do but continue on. This is not going the way I planned, but it is my only shot at it; my flight leaves the next day. Although it is difficult to see much past the streaked windshield and frantic wipers, I do notice the scenery is changing. Up until this point, houses have lined the road, but now there are fewer and fewer buildings, and the foliage is getting thicker. This part of the island is a rainforest, and luscious greenery frames the crashing waves of the ocean on one side and cascading waterfalls on the other. Small stands with various knicknacks, souvenirs, flowers, and snacks for sale appear on the side of the road. Many are unattended save for a money box and a sign asking customers to use the honour system. I’m sure it works. This is not a road along which you should tempt karma. This part of the island is a rainforest, with views of the crashing waves of the ocean on one side and cascading waterfalls on the other. Even on a rainy day like today, the road is packed with traffic, a cacophony of honking horns and lines of red taillights being more the rule than the exception. Occasionally a vehicle—usually a faded pickup truck—will honk impatiently before barrelling down the incoming lane and making death-defying manoeuvres to swing back into traffic. These are the locals, and I can understand their crankiness. They live in a rainforest and they still have rush hour. I am slightly ahead of the crowds in getting to Hana, which even for a small town seems pretty quiet. There’s a general store and several restaurants, little shops, and art galleries. I take a quick walk through town, but I choose to get back on the road after seeing a swift influx of rental cars. A few kilometres past Hana, I pass Oheo Gulch, the turnaround point for many visitors. The parking lot is busy; the nearby pools are must-see sights for many visitors. I press on, deciding to see some sights that are a little less crowded. It’s still paved here, but not nearly as well-kept as the previous sections, and it’s getting steadily rougher. It’s also narrow, with single-lane sections that occasionally turn into blind curves; signs are posted that tell drivers to stop and honk before driving through. These aren’t quite as common as the one-lane bridges from the first leg of the drive, but they’re just as adrenaline-pumping. Soon the landscape changes. Whereas I’ve spent the better part of the day navigating the curvy route through a rainforest, the road is straightening out, and the trees are thinning. I drive out from under a canopy of trees and see that the cloud cover—at least in this part of the island—has burned off; there’s blue sky overhead, and the sun is shining and sparkling on the blue water. It’s a bright, beautiful day, and suddenly this trip is a lot more fun. Until now I’ve been driving the Benz pretty fast, making minimal stops. Guidebooks and travel websites say that you’re supposed to take your time, stop where you like, and not worry about getting anywhere. I feel slightly guilty, like I’ve missed what I came here to do. I decide to pull over and explore the next time there’s room on the shoulder. I end up stopping in front of an old church, located on a vast piece of green property overlooking the water. It’s remarkably peaceful. The cemetary is in good shape, but the church itself looks pretty abandoned. The door is unlocked, so I peek inside. The interior is ruined, much worse than the outside; one wall looks like it’s covered in either mould or water discolouration. The pews are still there, but they’re scratched, scarred, and dusty. There is a lockbox by the entrance with a note that reads, “This church needs $20,000 for repairs. Please help.” I drop $20 into the box. Karma, you know. There’s a lot to do along the road, too much to see in one day: myriad beaches, waterfalls, and overlooks that are postcard-worthy photo ops. I head back to the road, but with a renewed energy. The views here are incredible. 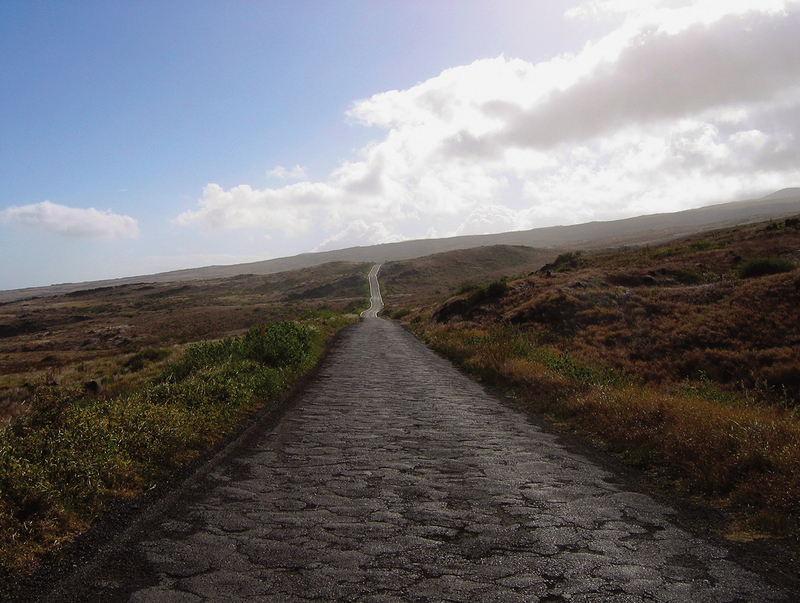 Gone are the trees; here, the land—made up of volcanic rock, sand, and the occasional shrub—slopes down to the ocean, and the road is unpaved. Gone too are most of the cars; obviously the rental waivers are succeeding in deterring visitors. The Benz is providing a great ride over the bumpy stuff, and really, aside from the occasional abyssal pothole, the road isn’t that bad. There are frequent cattleguards—which are warranted, I learn, as I crest a hill and come face-to-bovine-face with a whole herd of cattle grazing lazily on the few patches of green grass amongst the volcanic soil. When I finally reach the paved road, it’s such a change from the bouncy-rocky feeling that it takes me several kilometres to get used to it. I’m now on the west side of the volcano, and I can actually see the resort properties in Wailea below me; the highway is higher up the volcano, so although you’re only a few kilometres from the shore (and the hotels), there is no road that connects directly; you have to drive back through Kahului to the north and then back down south. The rest of the drive is unexceptional. Houses appear, then neighbourhoods. It isn’t long before I’m once again in Maui traffic. I drive into Kahului, then make the turn to head back to my hotel; it’s been a long day and I am very, very tired, yet also very satisfied. There’s a lot to see on such a trip, too much to see in one day. For one thing, Charles Lindbergh—yes, the aviator—is buried along the way at the Palapala Ho’omau Church. There are myriad beaches, waterfalls, and overlooks that are postcard-worthy photo ops. And the pools at Oheo Gulch are indeed worth a hike if you can get there early. But here’s the thing: on a trip like this, I don’t think there’s anything that should be visited. There’s so much to do that many people recommend overnighting in Hana for the full experience. But truth be told, there are only so many waterfalls you can look at, no matter how beautiful. Maybe it’s best to leave it open, and just take in what you can. 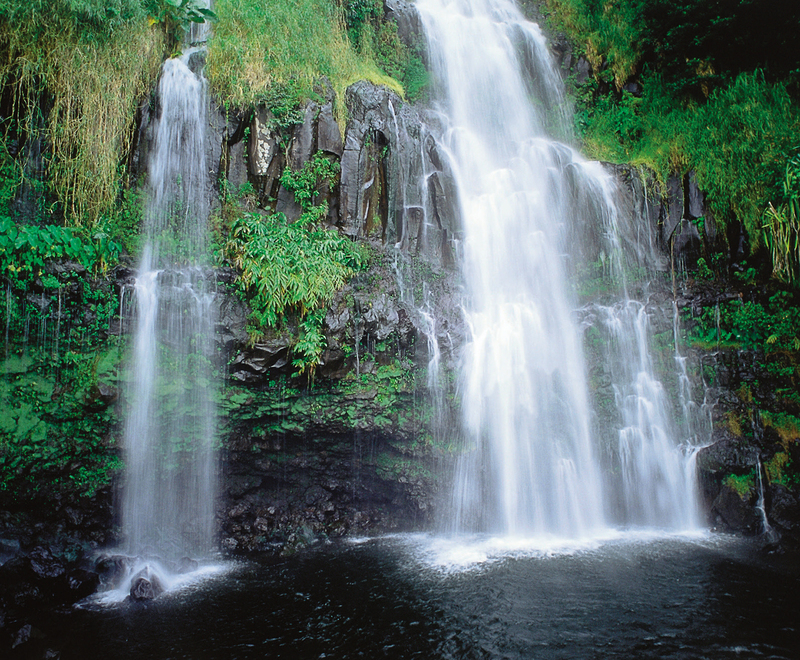 The experience of driving the Road to Hana, and visiting all the various attractions along the way, is a whole that’s more than the sum of the parts. Taken separately, it’s just a waterfall. Just a beach. Just a rainforest. But seeing it all, in the course of a day, is an incredible experience. It’s not about “conquering” the road, or ticking it off some checklist. It’s not only about the destination, no offense to Hana. And it’s not only about the views, either. But taken together, as a whole, the Road to Hana is a drive to remember. The well-known Hawaiian phrase Maui no ka oi translates as “Maui is the best.” Of the islands in Hawaii, Maui is quieter, more relaxing, and has some of the most luxe accommodations. 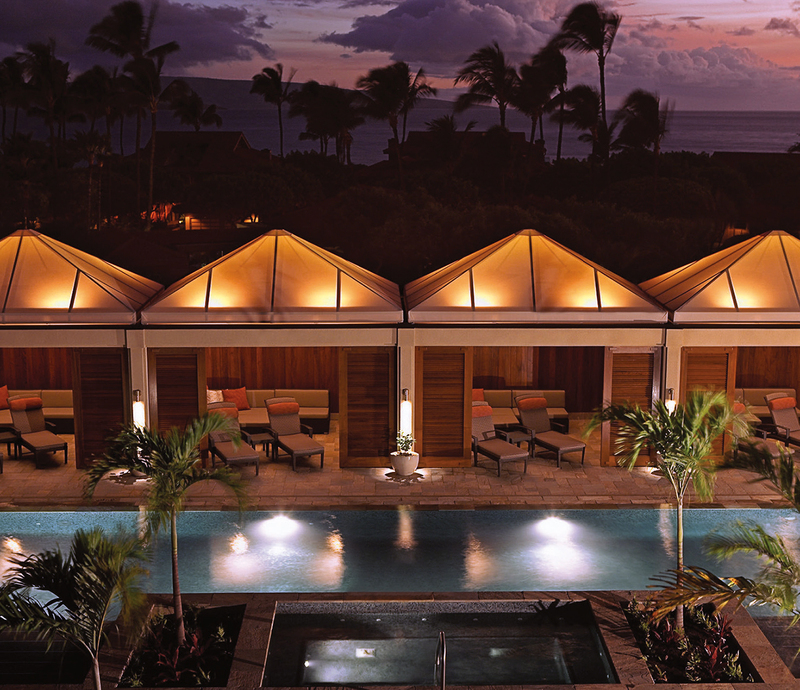 That’s the Four Seasons Wailea Resort, a place that’s mastered the art of relaxation. The beautiful suites feature dazzling ocean views, and the interiors are designed in a contemporary Hawaiian style with art commissioned specifically for the resort. And relaxing at the pool has never been so lush, thanks to the frequent but never obtrusive offerings including popsicles, massages, drinks, and sunscreen. A waterfall cascades nearby, providing pleasing background music and accompanying the ocean waves that crash only a few metres away. A new $9-million (U.S.) pool opened up last year, called the Serenity Pool. It features six 160-square-foot cabanas, which include flat-screen TVs, Internet access, stocked mini-fridges, and comfortable sofas. You’d be hard pressed to find a more paradisaical location for such a lack of activity. The food, too, is created with great thought, and with three restaurants, there’s great variety. Wolfgang Puck’s Spago Maui offers the chef’s classic dishes along with locally inspired cuisine. Ferraro’s Bar e Ristorante is an open-air experience right on the beach and features rustic Italian fare. And finally, the romantic Duo specializes in seafood and steak. The wine cellar and cocktail list here will ensure your dinner engagement lasts for hours.